Trixie leaves a pretty iron stain on Lou's shirt. 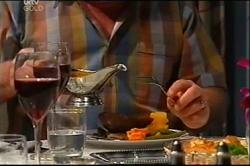 Lyn notices that Karl's wedding ring is missing. Summer storms off after Steph and Max make public their plans for a baby. Stuart walks into the pub and asks for a beer, and Lou asks why he hasn't brought his own in with him, which Stuart knows has something to do with his the work he did on Joe's ute. They talk briefly, before Stuart decides to go somewhere else for his beer, which is fine by Lou who turns around, revealing the pretty iron stain. Stuart says maybe he should buy his beer from Lou's pub, especially if he can't afford a new shirt. Lou then turns around trying to see the back of his shirt. Lou arrives home wearing a jacket and a blue shirt (the one with the pretty iron stain was white) and Trixie, after a bit of word play asks if he noticed the scorched mark on his back. He said he did after Stuart told him about it. Trixie then has a little hissy fit saying she can't be a house wife and Lou takes by the hand towards the couch and tells her if he wanted a housekeeper, he'd have hired one, not married her. Steph and Max are discussing Summer's outburst. They are both surprised, having expected Boyd to be the one who would be unhappy. Boyd then walks in and they ask him if he's OK with it, he says he is. Izzy then walks in and announces to them how upset Summer is. Boyd makes his exit as Steph and Max fire questions at Izzy. Karl is eating cereal when someone knocks on the door. It's Mal. Mal then comments on the state of 28, saying it stinks. Karl seems uncomfortable and starts clearing it up. He asks how the rest of the mob. Boyd offers to make Summer a cuppa. She thinks he's after something, but he tells her he's just trying to cheer her up. Boyd apologises for having freaked her out about the baby stuff and she tells him it's OK. She then tells him about what Izzy's been telling her. That mother's are always closer to their biological children. Boyd tells her that whatever Izzy told her, it won't actually be like that. She asks how he knows and he tells her, he felt the same way when their parents told him they were having another baby, but Summer still isn't convinced. Mal says that Susan told him that Karl seems very tense lately. Karl asks why she though he was tense and Mal says working mainly. 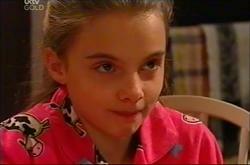 Mal then says he thought Susan seemed pretty tense and asks if Karl knew why. But Karl doesn't get the chance to answer because Izzy walks right in. Karl introduces them and Izzy invites them down to the coffee shop for hot dogs. 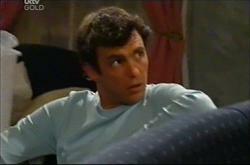 Karl then walks her out and Izzy tells him that Lyn thinks they're having affair. Max and Steph are trying to tell explain to Summer that if they did have another child, nothing would change their feelings for her. Steph then asks if they, Steph and Summer, can have a chat. Max says goodnight and leaves. Steph then tells Summer that she may not be Summer's mother, but she loves her like her own. She also tells Summer that she would love for Summer to be a sister to any baby of hers. A proper sister. Boyd grills Izzy about the stuff Summer told him last night. He doesn't seem at all impressed by her and Izzy realises that too. She tells him her mother left when she was that age, and she doesn't want the same thing to happen to Summer. Mal's at the coffee shop and Izzy walks in and they start chatting. Mal doesn't seem that impressed her, but she continues to try and sweeten him up. Toadie then walks in and they sit down for lunch together. Trixie sends Lou off to work after she tells him that she already has a schedule for herself to stick to. She tells him not to come back home till he's hungry because she'll have prepared a meal for them. After he leaves she starts sorting out some magazines and the TV flicks on. She seems engrossed by what's on the TV. Mal asks how Toadie is and Toadie tells him he's OK. Mal apologises for not having been there when Dee 'died'. Mal then asks about Izzy and Toadie tells Mal about the apparent attraction problems when it comes to Izzy as well as the dislike amongst the women of the street. Including Susan. Trixie is stuffing her face with truffles whilst still watching whatever's on TV. She hears Lou come back home and stuff the box under a cushion before getting up to greet him, saying he'd come home a lot earlier then she'd expected. 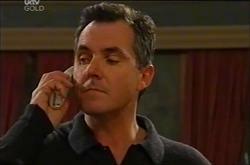 Mal's talking on the phone to Susan, he hears Karl drive up but she hangs up before Karl gets into the house. 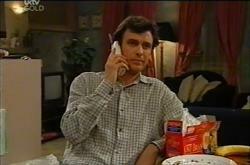 Mal tells Karl that if he calls now he could catch her, but he says he'll call later. Mal then heads off somewhere to catch up with Toadie and Karl asks if they're going somewhere he knows. Mal says probably not and leaves. Karl then dials a number on the phone and says "G'day". Trixie is singing to herself as she cooks whatever she's cooking but stops when she sees Lou watching her. He tells her she's a performer, she shouldn't be there peeling spuds. But she corrects him, as what she is peeling is not a spud but an "orange thing" (sweet potato). Lou tells her that if she wants to sing on-stage he wouldn't stand in her way but she tells him she wants to be an old fashioned gal and tells him to sit down. The beautiful assistant and the handsome chef (Summer and Izzy) are making pancakes. Summer asks Izzy to let her flip the pancake but it ends up on the floor. Summer says it's ok but Izzy says it's not and put it's on a plate. Steph and Max then walk in and Steph picks up the plate with the floor pancake. Izzy doesn't say anything, but Boyd notices and tells Steph to not have that one because it's cold. He then glares at Izzy. Lou is eating Trixie's dinner but it doesn't seem that edible. He chews it anyway. Trixie then goes off and gets the gravy which Lou seems grateful about until he tries to our some and it all slides out in one jelly like blob. She then tells him about her adventures with kitchen appliances and Lou seems a bit stunned. Maybe concerned too. Karl walks out of the house and drives off just as Mal comes out of Toadie's followed by Toadie and thanks him for letting him borrow his car. Karl and Izzy are sitting down talking. Izzy tells him that Mal thinks they're having an affair. At first Karl says he doesn't but then says he'll talk to Mal. Izzy suggests that maybe Susan told him something, but Karl says she wouldn't do that. Karl thanks her for coming out with him. She tells him it's a shame he wasn't invited to go out with the boys. 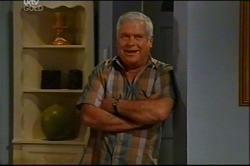 Karl makes excuses for Mal, saying that he and Toadie are close and probably want to catch up. They then talk about Izzy's day and how much Max's kids love her.